“Looper” starring Bruce Willis is a Sci Fi film set in a dystopic near-future. A killer who works for the mob of the future recognizes one of his targets as his future self. Set photos from New Orleans in March of this year reveal cars of the future that are a blend between advanced technologies and Mad Max, some of them electric cars using solar panels. 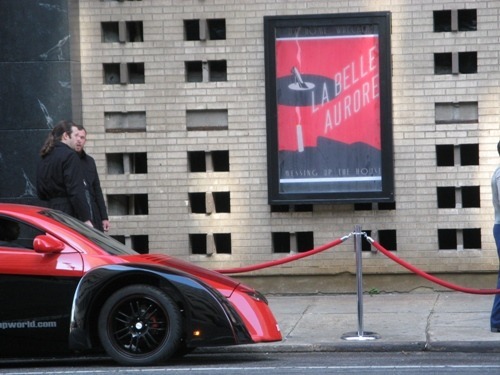 Several cars were requested for the film shoot including the ALIAS. From the look of the photos, you can tell they liked the ALIAS and we’re looking forward to seeing how they feature it in the film when it debuts in late 2012. We have hours of footage from the X PRIZE, but this is one of my personal favorites I’ve been saving for a cold winter day. This is the Skidpad test on which Consumer Reports tests all new cars. According to Wikipedia, a skidpad or skidpan is a large, circular area of flat pavement used for various tests of a car’s handling. The most common skidpad use is testing lateral acceleration, measured in g.
The test is carried out on a circular track with a calculated radius. A car driving on said track is slowly accelerated until the outermost tires on the car begin to slip. Going any faster would cause the car to drive outside the 300 ft radius. At this point, the speed of the car is recorded, and given the centripetal acceleration formula, v²/r, a car’s handling in terms of lateral gs can be derived. 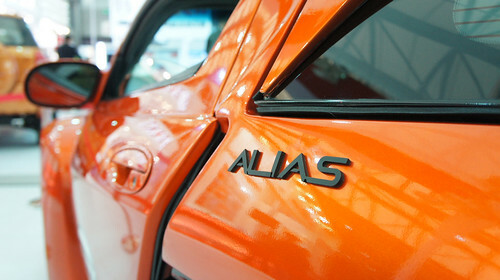 To pass the test, the Alias had to surpass 40 MPH to achieve a lateral acceleration of .7 g without losing control. As you can see, this was a piece of cake for the Alias and X PRIZE posted a result of .85 g, not bad considering Al Unser Jr. was just getting started when they called him in. 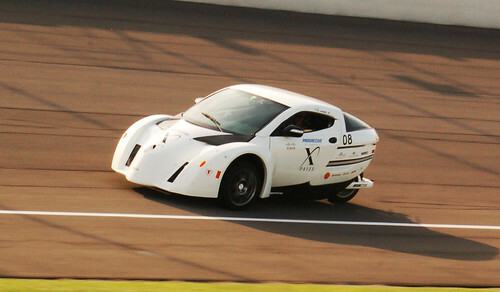 None of the X PRIZE cars in the Knockout Stage had a problem with this test and it was dropped for the finals. Thankz to ZAP Alias Team Member Prashanth Radhakrishnan for capturing this raw video, which was posted originally on Facebook in June.